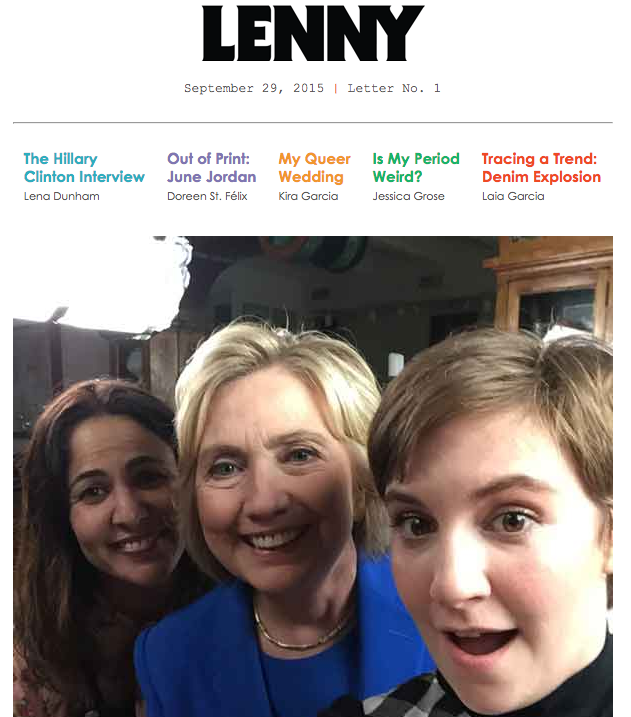 The lead page of Lenny, a new newsletter by actress Lena Dunham. Newsletters are the new black and white and read all over. While social media networks continue to dominate news readers, newsletters are quietly grabbing fans, niche by niche. Newsletters bring customized content to readers. They arrive in an inbox, but they aren’t intrusive. You can sell them through sponsorships. They are easy to measure. They get traffic for your stories. — They need to be curated by humans. The LA Times wrestled control of their many newsletters and gave them human control. The result? Lots of subscribers, lots of traffic. — They need to speak to the subject directly. Don’t be tempted to include cat videos in a newsletter for dog owners. — The headlines need to be chatty and not “headline-y.” You have a bit of room to bring the reader in. — Add a sign-up tagline at the end of any story. At Bizwomen, we’ve been able to get a lot of people to sign up merely with a hyperlink. BTW, For more from Bizwomen.com, sign up for our free email newsletter. — Push for signup through your social media channels. Do that regularly. — Aim to put fresh content on your newsletter, but you can also use them to repurpose old content, such as photo galleries. If your newsroom doesn’t do any newsletters, you might be able to use a service such as TinyLetter, which has an easy way to create and distribute newsletters. Todd Price of Nola.com, via Caitlin Dewey of the Washington Post, shares this list of cool newsletters.